Mental health issues are becoming more prevalent in the college setting, which is why it is important for students and concerned family members to be familiar with it. 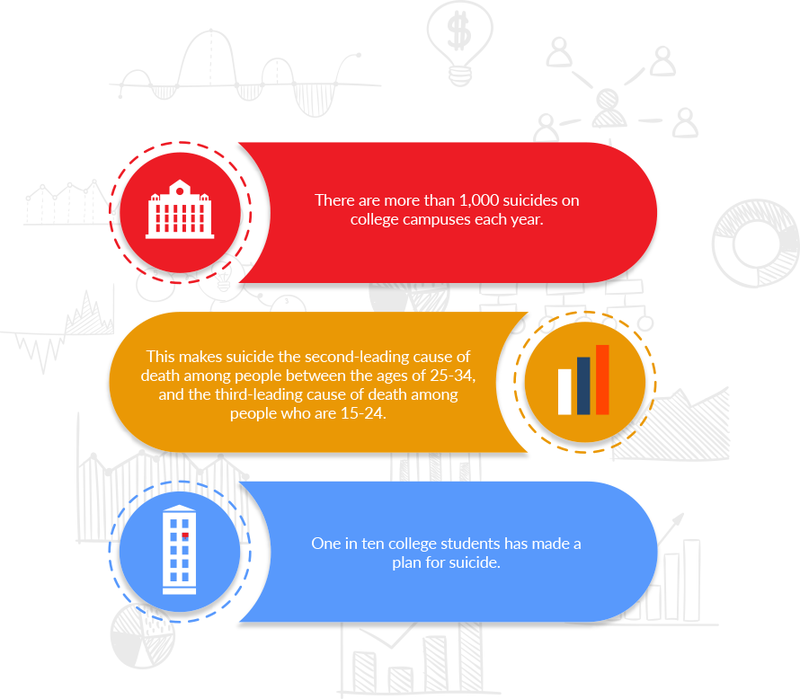 At CollegeStats, we designed this guide to help you identify the signs and symptoms of common mental health issues for college students. If left untreated, these issues can surely escalate and become debilitating for students. With that said, this guide will guide you on where and when to seek help as well. If you feel that you might be battling some mental issues or know someone that might be, then it is important to take action now rather than later. Mental health issues can take many forms. The popular ones include depression, anxiety, suicide, eating disorders, and addiction. While it may be difficult to come to terms with any illness, it’s important to be aware and be familiar with the resources available whenever they are needed. Students will likely experience some sort of mild depression at the very least some time during their college years, which can be normal. However, it’s crucial to know when you or someone might be going overboard and need medical help. Basically, depression is a type of brain disorder that is likely caused by a combination of genetics, environmental, biological, and psychological factors. More students than ever have been going in to see the doctors to get treated for depression today. Why is depression dangerous and something to take seriously? While it is a common illness that often makes you feel helpless and despondent, it can really interfere with your life and make it difficult to work, rest, and eat. When it starts to affect your way of living, then it's time to consider taking action to remediating the illness. If left untreated, it can lead to other more severe symptoms and/or suicide. Of course, we all have our good and bad days, and it’s completely normal to feel one or some of these emotions every now and then. For example, if you’re new to college and just moved away from home, you might feel an increased level of sadness, or might also have a hard time concentrating because you’re thinking about your family. It can be pretty stressful being away from home and having to adjust to a new lifestyle. Keeping these emotions in check and communicating frequently with those you trust about your feelings is the right way to adjust and be healthy. People can always see things more clearly when they aren’t dealing with it directly themselves, so you may be able to get valuable advice from a trustworthy family member or friend. However, if you feel that you might be feeling one or more of these on a regular basis, then you may want to check into your school’s mental health center and get evaluated. A health care professional will be able to assess and better help you determine what medications you need to take to improve, if any at all, or give more specific advice catered to your symptoms. Many people fail to get checked out because they are in denial or feel embarrassed to do so, but it’s always better to be safe than sorry. In this case, it’s also better to get treated while the symptoms are fresh, rather than wait until it’s too late. Everyone has their own insecurities, and this shouldn’t be one of them. Depression can be genetic, so if you do have history and are feeling some of the symptoms mentioned above on a severe level, then it may be worthwhile to check into a doctor’s office to get evaluated. Do you often experience extreme sadness or hopelessness? Despondence every now and then is completely normal, but if you find that these feelings are overbearing and potentially affecting your day-to-day life, it’s time to seek help. Have you been resorting to alcohol and drugs to alleviate any negative feelings? Unfortunately, alcohol and drugs are both not great escapes to relieving any pain or discomfort in feelings. They may be a temporary solution, but that’s about it. They may be a temporary solution, but that’s about it. Spare yourself possible lung cancer and liver damage by getting the proper medications that you need to fight depression as early as possible. Do you often think about commiting suicide? Similar to alcohol and drugs, suicide is never the answer. Even though it may seem like people are busy living their lives, you’d be surprised at how people will stop to talk if they see you open up and needing help. So, don’t ever hesitate to reach out to someone trustworthy to share your feelings with. That person can help guide you to the right people to get help before it’s too late. Life is not easy feat for anyone, and if you don’t feel comfortable opening up to a friend or family member, there are always counselors on campus that you can turn to confidentially. Anxiety and Depression Association of America - Learn more about anxiety and depression, how it affects people, and the measures to take before the condition(s) get worse. Get additional links that are designed for those looking for help and get a beter understanding of depressive mental illness. ULifeline - This is an online resource designed for college students to get information on tips for helping friends in crisis and suggestions for developing and sustaining good wellness habits. National Institute of Mental Health - Learn more in depth about the symptoms of depression and resources for getting help. American College Health Association - Check out the numerous resources available at the ACHA, such as helplines, brochures on depression, and external links for getting help. The Jed Foundation - This foundation supports mental health awareness nationally and connects students with health care providers. Nobody said college was easy -- in fact, there will be many moments in which students find themselves feeling anxious, whether it be over meeting new people or preparing for an exam. College is also a time when people are still learning more about themselves and growing at a rapid pace. With so much going on, it’s completely normal to get anxious. I mean, who wouldn’t get anxious over having to juggle many assignments, take rigorous exams, meet new people, and take on a part-time job? Don’t feel bad if you feel anxious, because chances are, many other students are in the same boat. While a certain degree of anxiety is acceptable, it’s important to know when it’s going overboard. Similar to depression, anxiety can easily escalate into something more harmful. With that said, students who feel that their anxiety is affecting their quality of living should most definitely consult a mental health specialist or counselor to determine the type of anxiety they have and figure out the best solutions to overcome it before it’s too late. Again, these symptoms are normal to a degree and experienced by people in and outside of school. However, if you feel that it may be interfering with your performance in your classes or interacting with people, then it may be time to seek help. Recognizing the signs is the first step to healing from any anxiety disorder. It’s important to note that occasional feelings of anxiety do not automatically indicate that you have an illness. If these feelings of anxiety persist, however, then it won’t be a bad idea to reach out for some help. Is it interfering with your perfoormance in school significantly? Is it affecting how you interact with other peers, your friends, and your family? Do you find yourself being constantly worried over just about anything and everything on a daily basis? Do you have fears that others find weird or irrational? If the answer is yes to one or more of these, it may be worthwhile to err on the safe side and seek medical attention. By seeing a mental health professional, you can get personalized guidance on how to heal properly. Anxiety Resource Center - Get information about anxiety on a more general level. This site has plenty of educational materials, a newsletter, and a blog to help you stay on top of current trends and research with regards to anxiety. Social Anxiety Association - Find useful information about social anxiety, how to deal with it, the different treatment options available to you, and where you can get help. Beyond OCD - If you feel like you might have OCD specifically, this link will provide you with helpful information to find support groups in your area. American Psychological Association - This resource offers a wealth of information related to anxiety disorders and depression, and also has tools to help you find a psychologist specializing in anxiety disorders to assist you. Anxiety and Depression Association of America - Learn how you can prevent, treat, and cure anxiety and depression. This resource gives a great understanding on how we can better understand anxiety and depression disorders. While these numbers do not reflect male behavior with regards to eating disorders, the illness is just nearly as likely to develop in males as it is for females. Many people don’t seek treatment because they might feel it’s taboo or that it’s embarrassing for anyone to find out about their disorders. Men are more likely to suppress themselves because anorexia and bulimia are often viewed culturally as women’s issues. What are some common eating disorders? – This is a type of binge eating disorder involving the act of eating a ton at once, and then purging all at once or excessively exercising after eating. - This is when you have strong cravings that result in unhealthy binge eating. Those with low self-esteem or confidence are susceptible to this disorder. – This is when someone has a distorted image of body image and constantly fears gaining weight, which results in poor eating habits and behaviors. 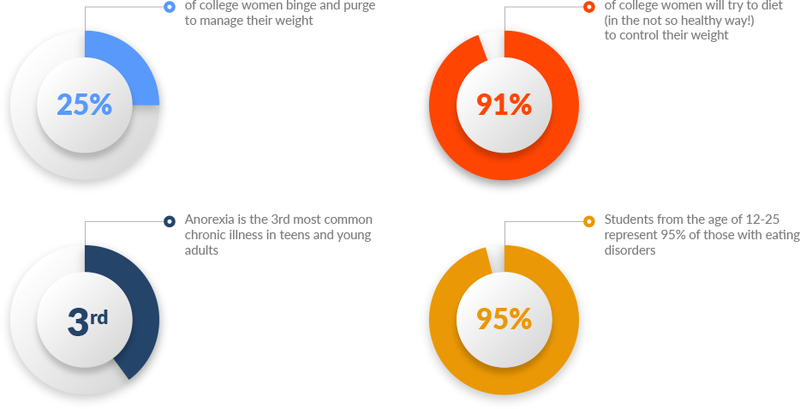 What are the popular symptoms of having an eating disorder? It’s important to keep in mind that we all have days where we don’t feel as pretty as we want to be, or we want to be skinnier. I mean, who doesn’t want to look like a supermodel straight out of a Vogue magazine? Despite this, it’s crucial to stay grounded and realize that flaws are what make us who we are. While it may be hard to squeeze in a healthy meal in between classes everyday, students should make a conscious effort to do so whenever possible. How can I Tell Whether I Have an Eating Disorder or Not? Do you feel constantly ashamed of your eating habits? Are you scared of eating in public, or eating at all because you’re going to gain weight? Do you eat large amounts of food, and then purge or exercise excessively afterward? Is your period irregular (women)? Are you obsessed with counting your calories? Do you constantly call yourself fat when nobody else thinks so? Do you skip meals willingly? 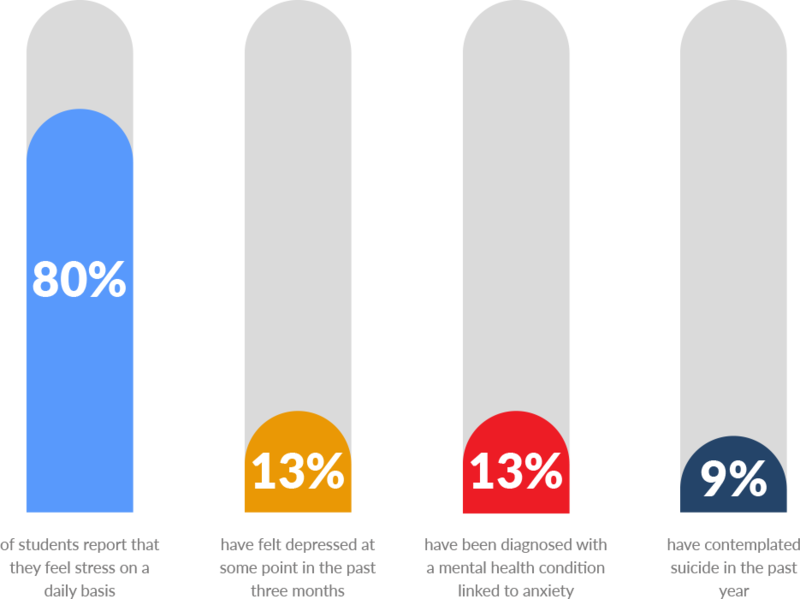 If you’ve answered yes to one or more of these and feel that your behavior is negatively impacting your day-to-day living, it’s time to seek professional help. When it comes to mental health disorders, it’s always better to determine and fix the problem as early as possible. National Association of Anorexia Nervosa and Associated Disorders - This resource is great for learning more about eating disorders. National Eating Disorders - Discover the different eating disorders and symptoms associated with each. Eating Disorder Hope - There is hope for those suffering eating disorders, and this site is geared toward helping people become aware of their problems, get recovery tools that they need, and access support and treatment. Academy for Eating Disorders - This network allows people to learn about the differences between eating disorders. It also helps them identify signs, symptoms, and find information for professionals in their area. National Eating Disorder Association - Check out the many links and other tools useful for seeking help regarding eating disorders on this website. The worst possible outcome to any untreated mental health issue is suicide. This can very much be avoided, which is why it is important to seek help early on when you think you or someone you know might need it. People can have suicidal thoughts for so many reasons -- whether it be discontentment in life of some sort, lack of self-confidence, feelings of hopelessness, excessive stress and pressure to fulfill standards set upon them… the list goes on. Anyone who has seriously considered committing suicide should consult a mental health professional immediately. There are plenty of suicide hotlines that are available to help and you can even be anonymous while getting the help you need. What are the causes of suicide? How Do I Know Whether I'm Suicidal? Do you experience extreme anxiety? Do you think about seriously killing yourself often? Are you avoiding friends and family you used to enjoy being around? Have you stopped attending social events you used to love going to? Are you abusing drugs/alcohol to “escape” your problems? Have you told someone you are thinking of killing yourself? If you have answered yes to any of these questions, tell a friend or family member that you trust or set up an appointment to see a medical professional for help before it’s too late. Suicide is tragic for those who love and care for you, and help is always available one way or another. The earlier you seek help, the better. National Suicide Prevention Lifeline - Use this lifeline to speak with someone about your suicidal thoughts and get help conveniently. The Trevor Project - This resource is geared toward the LGBT community with members of any age that may need a safe space to talk and find support. National Alliance on Mental Illness - Find information about suicide prevention and chat with someone available 24 hours regarding any crises here. Active Minds - This website has a library of resources for students in a suicide crisis, and offers a counseling search tool for finding professionals in their area. – Because college is a critical time where students are battling with finding their identity and transitioning into the adult life, struggles with identity are normal and expected. However, sometimes it’s possible to get off the grid. With that said, it’s important to know when to seek help when it’s needed. If you feel like you are severely stressed or anxious about your identity, it would be a good idea to speak with a counselor, close friend, or family member to get guidance. – This one ties in with suicide. People will choose to harm themselves because they don’t feel worthy of living or simply want to end their lives. Most will do this in areas of the body that others may not be able to see very easily. Self-harm is a serious issue and should be monitored by a professional mental health specialist. – Because student life is not easy in college, it’s normal to have ups and downs. However, constantly feeling bouts of depression and having periods of manic activity may warrant special medical attention. It’s so easy to pass off bipolar disorders as “mood swings,” but if it’s getting to the point where it’s affecting your daily life more than you can handle, then it may be time to seek counseling from a mental health specialist right away. Bipolar disorder can cause students to have a hard time focusing in their classes and as a result, doing well in school. With the high stress levels from overlapping exams, term papers, part-time jobs, and the need to socialize, college life can be a very rapid and extreme transition for many coming out of high school, or even a community college. It’s no easy task to juggle all of the tasks that students have to do, and as a result, many struggle with some form of mental health illness in college. As you can see, stress is a large factor causing students mental health issues. With stress comes a variety of other difficulties like sleep difficulties, weakened immune system, depression, etc. While the symptoms to the above illnesses are normal to an extent, it is important to know when you should seek help and where you can get help. Most colleges should have a health center where students can speak with a professional. If not, students can always call in to hotlines to speak with someone about their concerns.